Author, award winner, part-time magician and long-time professor Dr. Jim Kirby began his speech for the second installment of The Last Lecture Series at Tarleton State University with a video of himself riding a red Corvette to campus followed by a guitar duet with Dr. F. Dominic Dottavio with “Hotel California” by The Eagles playing in the background. Yes—that is really how it started. 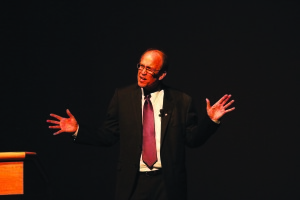 Tarleton’s tradition of The Last Lecture Series began last year with a lecture given by Dr. Chris Guthrie. Guthrie passed away soon after, on Nov. 3, 2014. 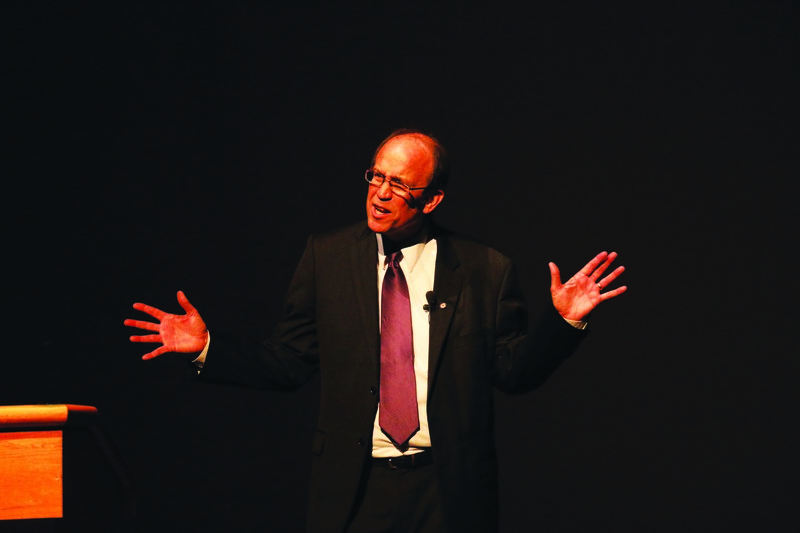 On Tuesday, Sept. 15, at 6:30 p.m. Kirby gave his Last Lecture speech, which was hosted by the Fine Arts Department. The Clyde H. Wells Auditorium quickly filled with audience members, and he soon had the whole crowd laughing. 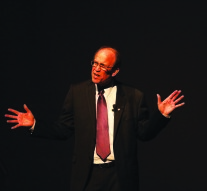 Dr. Jim Kirby, pictured above, made his audience laugh with his jokes and contemplate the importance of positivity with his words of wisdom in his Sept. 15 lecture of The Last Lecture Series. Kirby not only spoke to the audience but also spoke of his own experiences, recited a poem, told a few jokes and even let the audience see a magic trick. For the trick, he brought a newspaper to the stage and allowed the audience to see him tear the newspaper to shreds. Then, he crumpled the paper into a wad and unraveled it to reveal a whole newspaper again. “I’m going to create an illusion,” said Kirby as he did the trick. “The possibility-thinker just is not tripped-up by things that seem impossible. I tell you that this paper is not torn up. It is all in one piece,” he said as he unfolded a whole newspaper. Kirby’s intentions in this were to prove that nothing is impossible if it is believed not to be. He also spoke on the notion that all problems people face are not unsolvable, because they have likely been experienced before. By agreeing with such an idea, he believes that positivity that get anyone through any struggle. After entertaining the crowd with jokes and words of wisdom, Kirby sat for an open-mic questionnaire. During the Q&A, he admitted that his favorite song is “Take it Easy” by The Eagles, his biggest pet peeve with students is when they do not come to class and he once won $500 in a writing contest after being bribed by his dean to enter. Following the Q&A, Kirby was awarded a plaque and a signed and framed ticket to The Last Lecture. His eldest son also awarded him with a new red Corvette—a toy one, of course.